Liven up your decor with this impressively designed chair. Add color and style to your kitchen, patio or bistro. This colorful chair is a rare find that is crafted in a transparent rain flower design. The versatility of this chair easily conforms in different environments. Chairs are lightweight and easily stack for storing. The frame is designed for all-weather use making it a great option for indoor and outdoor settings. For longevity, care should be taken to protect from long periods of wet weather. The legs have protective plastic feet that prevent damage to flooring. 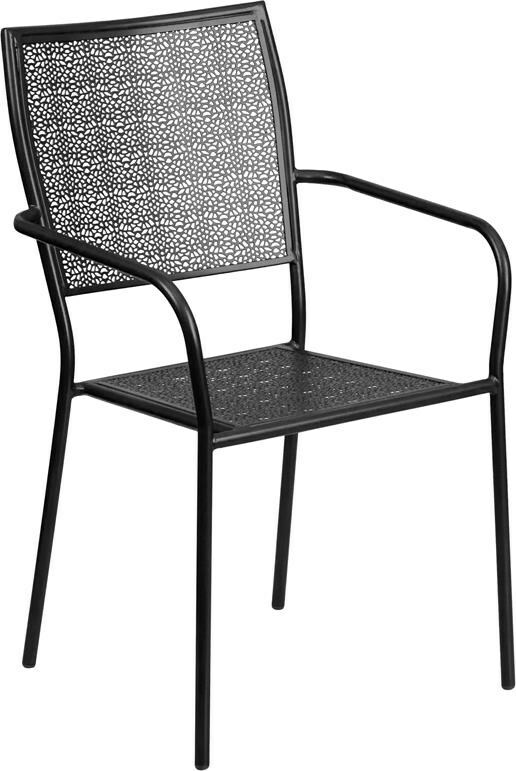 The Metal Indoor-Outdoor Chairs Black Indoor-Outdoor Steel Patio Arm Chair with Square Back by Winslow Home at Sam Levitz Furniture in the Tucson, Oro Valley, Marana, Vail, and Green Valley, AZ area. Product availability may vary. Contact us for the most current availability on this product. Browse other items in the Metal Indoor-Outdoor Chairs collection from Sam Levitz Furniture in the Tucson, Oro Valley, Marana, Vail, and Green Valley, AZ area.